The Impakt Festival is the annual culmination of the activitiesof Impakt as an organisation that specialises in critical media culture: a multimedia festival with conferences, readings, performances, screenings, exhibitions, presentations and music. Many people argue that, so far, humanity hasn’t come up with any feasible alternatives to capitalism, whilst at the same time this economic system seems a dead end. With the world population increasing, imminent energy and natural resources crises and the growing complexity of financial structures we want to study the future of capitalism as our society’s basic principle, possible alternative systems, the role media culture plays in a market economy and how new technologies and small scale initiatives can offer solutions. We expect curator(s) to present a clear vision on the above issues in order to investigate and analyse both past and future structures using the programmes they curate for the 2013 Impakt Festival. The curator or curatorial team can be responsible for the entire festival programme comprising films, lectures, new media projects, presentations, a music programme and an exhibition. It is also possible to submit a proposal for one or several parts of the festival programme. For more information on the festival theme, the programme structure and submission guidelines, please seewww.impakt.nl. 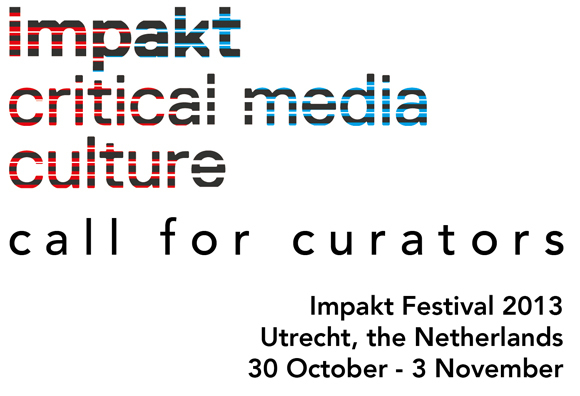 Next to the call for festival curators, Impakt is open to residency proposals and video submissions. Alongside the call for Festival Curators, Impakt is also holding an open call for artists and researchers for our residency programme, Impakt Works: a residency programme for artists working with digital media, video, sound, interactive technologies, etc. The Impakt Works residencies are project-based and should culminate in a finished work; for instance, an (interactive) installation, a performance or a video. Applicants should be prepared to carry out and complete their proposed project within the two-month duration of the residency. The Impakt Works Researcher residencies provide facilities for a short, informal visit where young international writers and curators investigate the Dutch art scene, the Impakt archive or specific subjects. Thedeadline for residency proposals is 1 April 2013. Read more about the guidelines for the residencies on our website. Finally, we are also open for submissions of new film and video works. Impakt annually programmes an exciting international overview of video art during the Festival in the so-called Panorama Programme. We look forward to receiving your submission of daring, experimental, critical, subversive, unheard-of and surprising film and video work, produced in 2011, 2012 or 2013. Please note that there is no thematic restriction for this call and that the Panorama Programme is not connected to the ‘Capitalism Catch-22′ programme. The deadline for submissions is 1 May 2013. Read more about the guidelines for the submission on our website.